Aging educational buildings are a concern across the country. About 25 percent of campus buildings in the United States are more than 25 years old, and an additional 25 percent are more than 50 years old. Most of these are largely untouched with renovation. The result is that today’s facilities managers are holding significant deferred maintenance problems at bay, with limited budgets earmarked for ongoing preventive maintenance rather than emergency repairs and major upgrades. Yet today’s arts students and parents expect facilities comparable with other new buildings on campus. Faculty and deans consistently report that students are coming from K-12 schools with better music, dance, theatre and art facilities than those on their college campuses. Students and parents are more discerning about the quality of amenities offered on campus, which influences their decision on where to enroll. As such, colleges are upgrading arts spaces to meet student and parent expectation and successfully compete with peer institutions. And what colleges are hearing from parents and students is driving the programming of arts spaces. So, what do students want? Everyone wants makerspaces—and on display. But makerspaces are more than just 3D printers. Visual and performing arts students spend a great deal of time in their buildings, typically expecting 24/7 access. Their project work is not easily transportable—and rarely in 8½ x 11 format. Arts facilities are essentially large, interactive makerspaces where they can create art. And while art can “happen anywhere,” some of it really needs the proper setting where students can safely develop their craft. Studio Arts programs require innovation, introspection, and creation. Diverse materials, methods and expression warrant spaces for individual exploration, as well as spaces for interaction and critique. Studio arts rooms call for superior lighting and ventilation. Dust, particles and vapors dispersed as part of painting, sculpture, ceramics, printmaking and photography should not be breathed. Metals and wood dust should be separated. Proper ventilation needs physical pathways and therefore planning. Theatre programs involve long hours rehearsing, designing, constructing, and producing—and that must be onsite. We often think only of our audience experience. But every part is also a teaching/learning station. Physical safety takes on new meaning when you are working with students of varying skills and capabilities, in dark spaces, on ladders and catwalks. The Union theatre or roadhouse cannot be the model for student use without additional provisions and appropriate backstage functions. Scenery, props, and costume shops need proper equipment clearances, durable surfaces, as well as localized process ventilation. Music programs demand practice, practice, practice. Music practice and rehearsal require acoustic conditions that allow students to hear the music clearly—both what they are playing, as well as that of their colleagues. Sound isolation should keep noise out, and loudness control through appropriate room surfaces and size are important. This is not just for the quality of the sound but for hearing-loss prevention, of particular concern for faculty who return year after year. Humidity levels are also important to protect voices, as well as pianos and string instruments. Dance requires physical commitment and execution of technique and gesture. Warmup is critical, and room temperature, humidity and floor resilience prevent injury. Sprung floors and controlled temperatures are vital to the muscles of dancers. Warming up is standard protocol for athletes, and the classroom or activities of the dance student are intense. The quality of the space itself is clearly important to the learning process. Yet with funding tight, how do you make your case to non-arts leadership and decision-makers? Part of the solution is using potential funding wisely and strategically to get the most of out your investment—and communicating how wise use of funding can enhance both the arts and the campus as a whole. That often starts with the design process and clearly outlining steps to a successful planning and design process to create the ideal teaching environment. The visual and verbal languages of architecture can support arts learning environments—and persuade legislators and donors that their investment will be a wise investment. To have a successful planning process, participants need to understand each other’s language. For architects, this means being precise communicators, listening carefully, and having a clear understanding of the unique requirements of each discipline—and developing solutions that will truly elevate the art of arts education. Owner groups do not want their design team to plan generic spaces, or simply be the low bidder. They want the best solution and original insight at the best price. This is possible when everyone works together to achieve a shared goal—campus leadership, students, design team, and the larger community beyond the immediate arts programs. Several recent examples demonstrate how colleges, students and architects have come together to create arts spaces that excel as learning environments, meet challenging budgets, and enhance the overall campus experience. Boise State University in Idaho, for instance, is building a new Fine Arts Building to consolidate the visual arts programs, galleries, and the new World Museum into a single building while reaching out to the entire community. Designed to support the creation, study and display of art, the 90,000 square-foot building includes studios and classrooms, an interactive World Museum where students can virtually visit museums around the world, a two-story entrance atrium visually open to campus, and a 4,000-square-foot gallery that invites the public and campus community to view exhibitions. For campus leadership, the Center for Fine Arts is a compelling opportunity to highlight how the visual arts and humanities are important to the entire campus. 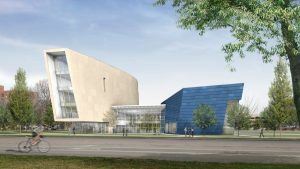 Similarly, at Carleton College in Northfield, Minnesota, the Music and Performance Commons addition at the Weitz Center for Creativity unites the Music Department with the Theater, Dance, Cinema and Media Studies into one facility, creating opportunities for cross-disciplinary collaboration. 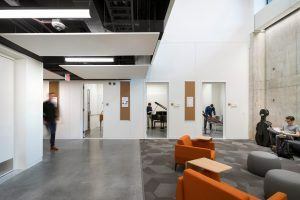 The 55,000-square-foot addition includes a 400-seat Performance Hall, rehearsal spaces for individuals or small groups, practice rooms, teaching studios, informal collaborative spaces, and faculty offices. Each flexibly designed space can accommodate students from all disciplines for study, practice, research, exploration and performance—thus extending the value of the financial investment. 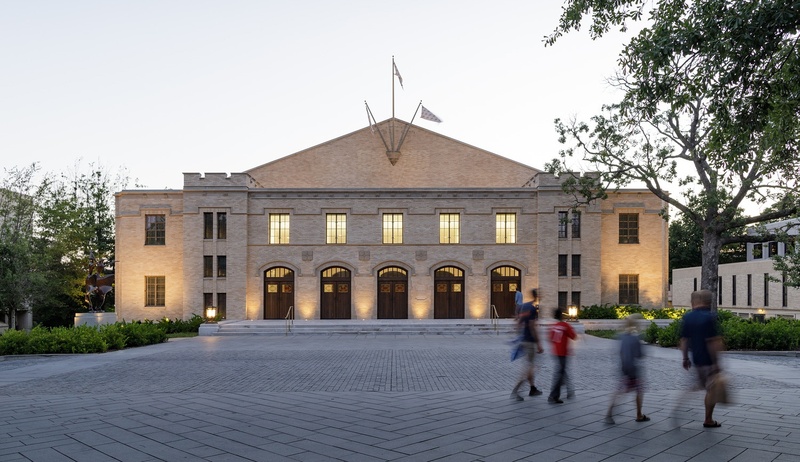 “The design integrates the flexibility needed to support our students’ cross-disciplinary explorations, scholarship and performances while establishing a collegiate and context-sensitive presence,” said Steve Richardson, the Puzak Family Director of the Arts at Carleton College. For instance, the Performance Hall supports large or small performances, in which the stage “wings” can pivot to provide access points for theater or dance productions, and acoustical towers can roll forward to create a smaller space for more intimate performances. Additionally, a large rehearsal hall doubles as a flexible backstage for the Performance Hall while variously scaled rehearsal halls can meet different rehearsal needs, serve as master classes with visiting artists, or function as performance space for small ensembles. The Music and Performance Commons was part of Carleton’s strategic vision to bring all the arts together, providing long-term, cost-effective flexibility. A more unusual solution was sought by the University of Arkansas, where the university transformed an historic 1937 Fieldhouse into a new Concert Hall. 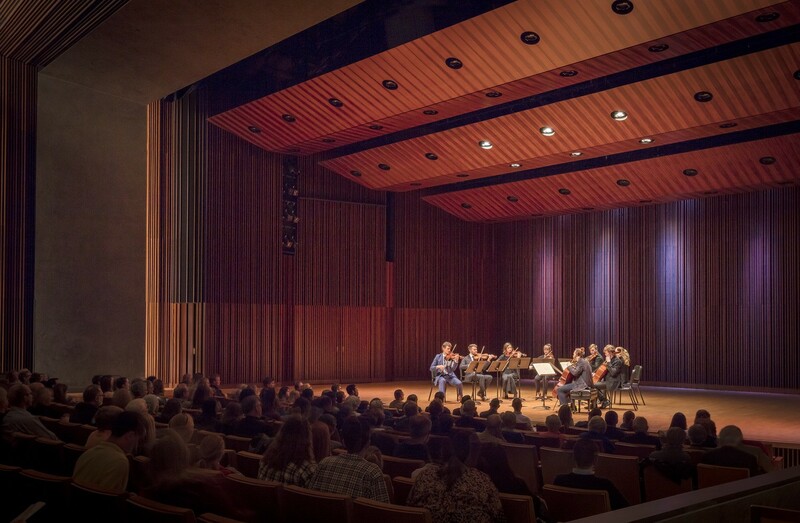 The Jim and Joyce Faulkner Performing Arts Center includes a 600-seat Concert Hall, new lobby and support space for the Music Department, providing students a state-of-the-art venue for practicing their crafts while hosting guest musicians for the campus and Northwest Arkansas community. Students and faculty deserve to learn, explore and teach in appropriate spaces for their discipline. Deferred maintenance can be strategic, but much of the backlog is overdue maintenance. Help your leaders make a case for your needs. Renovation projects may make huge differences—and occasionally new is less expensive. Safety-related projects can be undertaken in small steps, addressing individual processes, materials, and room conditions. Comprehensive approaches are great, but sometimes lead to all or nothing choices, resulting in no action. Educational and business narratives swing in support of the arts, and then against because of emphasizing STEM. Recently, humanities degrees have been noted as the genius behind many of the best employees and high-level thinkers at today’s tech companies. The pendulum in support of the arts is swinging back again due in part to ongoing research into neuroscience, creativity, innovation, and education in music, theatre, art, and dance. Collaboration with colleagues can help to articulate and strengthen your story to build funding support. Academics in the arts must always be ready to share the value and demands of the arts using specific examples to paint a picture for non-artists.